Have you ever had a dog that grew old? At the dog’s peak, it was your best friend. There are no other creatures on earth capable of giving so much unquestioned devotion. And you love it back for that very reason. They’re marvelous animals. And then one day, it begins to grow old. You ignore it at first. After all, your dog is your pal. It’s man’s best friend. You just want the good times to continue in whatever way they can. But time marches on, and the dog’s physical afflictions pile up. Things get serious. You begin to think things like “Ol’ Blue won’t be around much longer so I have to enjoy the time I have left with him.” And yet, you’d never dream of giving up on the mutt. They wouldn’t give up on you, would they? You’re going to see it through no matter what happens. Finally, a day arrives where you realize that the dog is suffering merely by being alive. That is precisely how I feel about The Simpsons these days. It’s important to note that the peak of the show–the first eleven or twelve seasons–was as good as the peak of any other show in TV history. It was magic. Sunday nights were appointment television because of Homer and his family’s antics. The show was dripping with phenomenal humor written by comedy writing titans. But friends, Springfieldians, noble countrymen, lend me your yellow ears; I come to bury Homer, not to praise him. 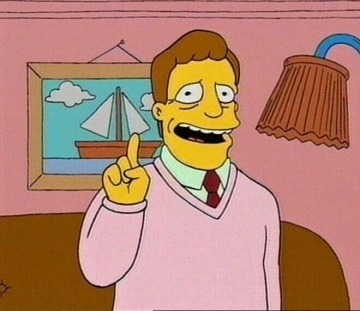 Hi, I'm Troy McClure. You might remember me from the best run of television that any series has ever had. I couldn’t tell you the exact moment or season that the show began to decline. I would venture that it was sometime around the year 2000. Episodes became formulaic. The same handful of plotlines were on constant shuffle. Homer is an awful father; Marge feels neglected; Lisa takes a political stance; Bart’s misbehavior goes too far; Homer is an awful employee. The guest voices were no longer a bonus. They were an often-forced necessity. The show grew slightly more vulgar, which nobody would mind if it was humorous. Probably the biggest series of events in the decline were the untimely passing of Phil Hartman, followed by the decision of Bill Oakley and Josh Weinstein to step away from the show. That trio was the glue that took the show from hilarious to sublime. I actually saw this when it first aired. Despite all of this, I still watch the show. At least a few times a year, it will flex the comedic muscle that made me fall in love with the show when I was a 13 year old watching it debut in December 1989. For a few years, I practiced a little bit of cognitive dissonance, reassuring myself that it was “still better than a lot of other things on TV”. But it’s gone beyond that stage. Now I fear that the show is hurting what should be a monumental legacy. It saddens me to think that teenagers out there now who watch The Simpsons have only experienced this strange, mediocre product without ever seeing the sheer brilliance of the first decade. Everything I’ve said here, I’ve said only because I want the show to be remembered properly as the ingenious show that it was for so very long. I can not stress that point enough lest I be painted as a Worst-Show-Ever-ing Comic Book Guy. More often than not now, I’m left disappointed, left to clean up the mess that the show has made on my mental carpet. 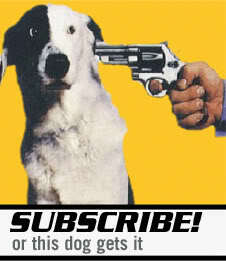 And just like that sad dog owner, I’m now left with a conundrum. Why don’t I put it out of its misery by turning off the TV? I wrestle with this every Sunday. I’d feel horrible giving up on it after it brought me so many laughs through the years. At some point, you’re doing the dog a favor. I wish I could determine when that will occur. I’m more of a movie guy, so I always am trying to minimize my television watching. I’ve found the best cure is just to immediately go cold turkey. You very quickly realize that it was wasting your time. Even if a show is occasionally funny, there are better things to watch and better ways to spend your time. I’ve definitely become a lot more discerning over the years, although there are definitely still a few shows that could use the axe. I quit watching The Simpsons on TV a long time ago. Groening & Co. just need to give up already. Oh wow… that link is a gem. I like having the syndicated episodes on around dinnertime, although my local affiliate has stopped running all of the older ones. I think if it’s available on DVD, they won’t air it in syndication or something. I feel a lot like you about the show! It used to be an institution and a hip thing to watch The Simpsons. But like Fellini’s late films it became a parody or a pale copy of the original that hooked us at the first place. 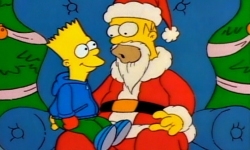 The Christmas special that you displayed over is a classic and I will watch it soon since the Holidays are coming! I’ll have to watch my DVDs of the first seasons to forget how the latest episodes are flat. The link that Kelly just posted looks like a lot of help watching the early episodes. I love Springfield and the Simpson’s World however you can only focus on the same characters so long. That’s why I propose that the Simpsons pull a “Mayberry R.F.P.” When Andy Griffith left the Andy Griffith Show, it continued for three years under the name of Mayberry R.F.P with most of the main characters remaining on the show. It continued for three years until CBS’s rural purge of 1971 resulting in the cancellations of the Beverly Hillbillies, Green Acres, and anything else with a rural setting. The Simpsons can focus on supporting characters that we love but have not been subjected to the same recycled storylines. This is a real tough call but I think with the number of years the Simpsons has put in, you’re safe for venturing out if you feel the desire too. I stopped watching The Simpsons back in high school (around ’02/’03) and haven’t looked back. I find it easier to drop shows like The Simpsons which go on and on, moreso than shows with a narrative that I want to see through even if I’m not wholly invested in the recent developments. Very true. Then again, I’m also a lot pickier about which of the “narrative” shows I’ll watch. I’ll watch just about any cartoon at least once. The narrative shows usually take a year or two of solid reviews before I’ll make the leap. I’ve watched the Simpsons all my life. I’m only two years older than the show. I grew up with it, and I too see the decline. I just don’t watch it any more. I stopped watching it a few years ago. I stick with FAMILY GUY, which might also be going down the drain in the next few years, and after that? Then I’ll just stop watching animated shows. I have enough BREAKING BAD and BOARDWALK EMPIRE to catch up on. I still enjoy Family Guy, although there was a South Park episode or two that completely nailed Family Guy. It sort of lessened my opinion of the show (Family Guy) quite a bit. It was great satire on the part of Parker and Stone. Couldn’t have said it better myself. For some reason I found myself watching a new episode that had Katy Perry for no discernible reason, either plot or humorwise, and I gave in. I won’t watch any episode past, say, 2002. It’s just too painful. I want to remember the good times, not this, not what it’s become. I know many internet “experts” have spent billions of pixels trying to figure out when the show jumped the shark. But in my mind, it’s a two episode tandem. I don’t know or even want to look up if they were in the same season, they just go together in my mind: the Frank Grimes episode, and the Maude Dies episode. In those two, Homer seems to morph from inept buffoon with a heart to a jerkass just for the sake of having a plot; at the same time, the humor turned more crass and meanspirited, with less of the sweetness of the family’s story showing through at the end of the day. 2002 is a pretty good marker. I know that 2000 and before, I was still laughing and looking forward to it. And then sometime in the 2002-ish years is when I started wondering what had happened. I couldn’t pinpoint it at all, and you’re right- SO many fans have an opinion about where it lost it officially. The fact that there are so many candidates speaks volumes. The Simpsons stopped being any good more than 10 years ago. Seriously. Actually I watched the Halloween episode a couple weeks ago and that was the first one in probably 7 or 8 years. It was disappointing, nothing like the Halloween episodes of yesteryears. That Halloween episode was a perfect example of how I feel about the show these days. I got one or two big laughs in there- seeing a paralyzed Homer swinging around like Spider-Man cracked me up- but otherwise, it was really mediocre. I love(d) The Simpsons…but Futurama has been cracking me up more over the last few years. Oh yeah… I’ll always have a soft spot for Futurama. It’s very high up there for me. Community is replacing The Simpsons for me. I did exactly the same this past weekend. DVR’ed it, watched it, mostly disappointed, now feel ashamed. I grew up with The Simpsons. I adored it. I could barely wait until the new shows on Sunday at 6. I bought the episode guides, it inspired me to watch the films and shows it referenced, I had a quote for almost every situation. Then something happened (I can’t really remember where) but I stopped enjoying the show as much as I had. That episode is relentlessly awful. I remember seeing it when it first aired and thinking they’d hit a new low. I cant give up on Simpsons,That show gave me more joy than any other show on TV.even now the early seasons are my favorite comfort TV ,just one episode always make me feel better.As long as a new episode is shown i will keep watching it.